I think that monotheistic religions, having a common reference to One God, should and must dialogue. The three religions which Abraham inspired have many more common facets than those which divide them. Religion must be the means by which to affirm the ethical significance of existence, regardless of one’s profession of faith. The faiths of Judaism, Christianity, and Islam share a large number of theological beliefs and ethical principles. In fact, all three religions revere the Prophet Abraham and share more in common with each other than other religious traditions. Most importantly all three religions affirm the existence of one God, the Absolute and Infinite Reality continuously creating and sustaining all things in existence [for a rational and logical proof of this classical concept of God, click here]. 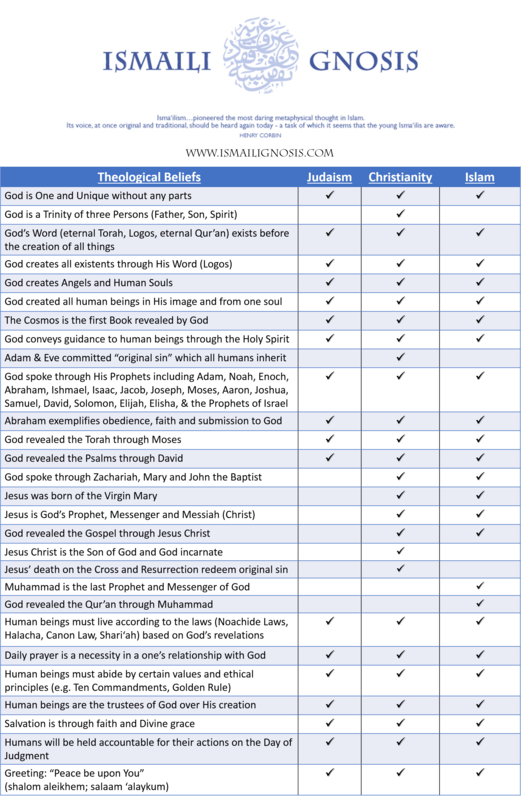 The below chart presents 28 key theological beliefs of Abrahamic monotheistic theology in which the general Jewish, Christian and Muslim positions overlap greatly. It is hoped that readers will see how much commonality exists between the faiths of Judaism, Christianity and Islam and how this unites all Jews, Christians and Muslims in a spiritual bond of brotherhood. (All of these theological positions have more specific interpretations among the different branches of each faith, but they are presented here at the most basic level). This means that the Judeo-Christian and Muslim civilizations share a religious, cultural and spiritual ethos: there is no clash of civilizations but only a clash of ignorance. But this ignorance can be healed with education and the embrace of difference through pluralism. Another, even more fundamental reason for the underlying inner affinity of the two civilisations is to be found in the shared point of origin of the three monotheistic religions of Islam, Christianity and Judaism. All are linked to a common ancestor — Abraham — whose mythical presence has survived in the citadel of Aleppo. Islam, the most recent of the three revelations, has always acknowledged and confirmed the older religious traditions and has also provided, through its various regional cultures, successful models for religious and ethnic coexistence. Recent press references to the Shari’a, the traditional Islamic system of jurisprudence, are illustrated by its manifestations in Afghanistan. Journalists learn to use these words — but how many of them know what they really mean? How many of them understand, for example, that the Shari’a is seen by most Muslims as a changing body of law, subject to what we call the fiqh, the capacity for evolving interpretation. How many of them are aware of the selective and moderate application of the Shari’a in the legal systems of those Islamic countries which do allow its application? How many of them know that Arabic translators of the Old Testament used the word Shari’a to designate the Torah, underlining a shared perception of the Divine Law that governs the spiritual relationship between God and His believers? How many are knowledgeable enough to appreciate the Shari’a’s illuminating qualities in civil law? Judaism, Christianity and Islam share a great deal over practical matters of daily living: the necessity of daily prayer (formal prayer, informal prayer), of living according to God’s will expressed through rules of of conduct, common values and ethical principles; salvation by faith and Divine grace, the accounting on the Day of Judgment, and benedictions of Peace (shalom, peace). What I am saying is that the basis of an understanding can be put into effect through the acceptance of the ethical principles common to the Abrahamic faiths. Forms are different. The ethical principles, the principles on which the human society lives, the attitude towards the poor, the attitude towards the marginalised, the attitude or the preoccupations of a society dominated by the male portion of the society, all of that, we can find it everywhere. We find it in the Christian society, in Christian cultures of the past, of the present, and in the Muslim World it is the same thing. There are those who say that faiths divide. This may be true. But today we must explore every opportunity to have different faiths come together in addressing the problems of our respective societies. We come from the same common religious heritage, descendants of Abraham, and it is enjoined on us to address the problems of society on the same ethical premises.